LOVE is fleeting. But it'll be back. The iconic LOVE statue will be removed Wednesday to undergo some refurbishing before it gets re-installed in a made-over JFK Plaza (aka LOVE Park) in a few months. 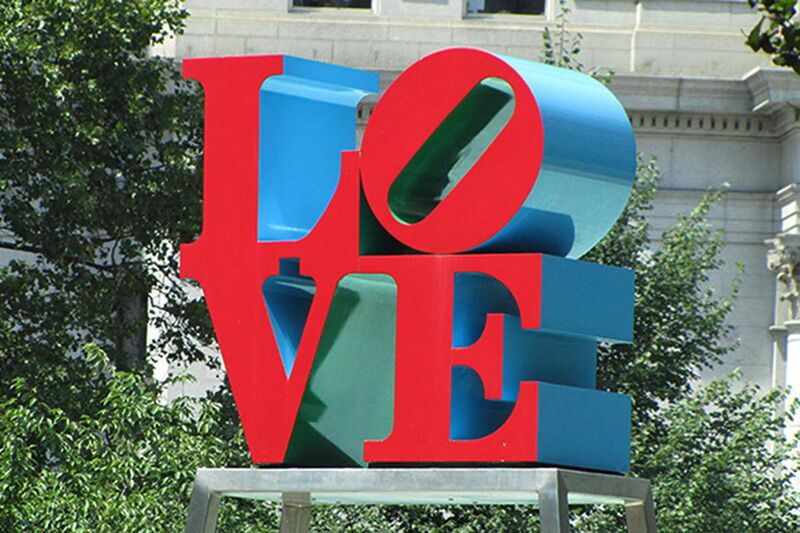 The Center City District is throwing a big Valentine's Day send-off for the cherished Robert Indiana statue, complete with a Philadelphia Orchestra performance, flower arranging classes, DJs and free red roses. SEPTA is also seeking public transportation love stories. The most moving tale gets a $100 giftcard to Dunkin Donuts. The city moved the statue from LOVE Park to Dilworth last February, using a forklift, the same one that has carried the Liberty Bell around. Last we checked, LOVE Park was slated to re-open in late Spring. The city's Art Commission is currently considering whether to approve a new design for the very basic base of the statue, which was designed by a member of the Department of Public Property in the 1980s, Jared Brey reported. Learn how to craft a gorgeous display at Valentine's Day Floral Arranging, led by Shawn Alexandra Graham, Floral Stylist/Event Designer, 10 a.m. – 11 a.m. in the Rothman Institute Cabin. Participants can enter to win a raffle for the flower arrangement made during the seminar. After the demo, stay for lunch at the Cabin, and then take a romantic stroll through America's Garden Capital Maze, with evergreens and twinkling lights. Greater Philadelphia Gardens, which partnered with the CCD to create America's Garden Capital Maze, presents free horticultural programs for both families and adults through February 25. All programs will be held in the Rothman Institute Cabin and are made possible by generous funding from the William Penn Foundation. Feeling classical this Valentine's Day? Bring your date to glide on the ice to the sounds of music recorded by The Philadelphia Orchestra, noon – 2 p.m., as part of Philadelphia Orchestra presents Symphony Sundays at the Rothman Rink. After skating, cozy up with your sweetie around firepits in the backyard at Rothman Cabin, where wine, beer, cocktails and hot cocoa are available for purchase. Sweetheart Skate at the Rothman Ice Rink, 4 p.m. – 8 p.m., features buy-one-get-one-free admission, and lots of love-themed fun. Come skate to love songs new and old, and remember this special evening with a complimentary rose and keepsake photo from the photo booth. Inside the Rothman Cabin, there will be Make-and-Take Valentines. There will be specialty Champagne and Chambord drinks, small packages of Brûlée's chocolate truffles and heart-shaped red and white macarons available for purchase. SEPTA is asking "Did you find love on Septa?" Stop by the Septa table and share your love story. Sweetheart Skate is also sponsored by Cardiologist Consultants of Philadelphia and Subaru's Share the Love program. Join Delaware Valley Legacy Fund and Philadelphia Gay News for a night of ice skating at Rothman Ice Rink for Skate. Pride. Love: An LGBT Soirée, 6 p.m. – 10 p.m. Dance to music from DJ Carl Michaels, as host for the evening, Brittany Lynn, entertains the crowd. Inside the Rothman Cabin, enjoy a rainbow-themed drink specially priced for $5, 6 p.m. – 8 p.m., and specially priced menu items. $20 admission includes skate rental, plus donation to Delaware Valley Legacy Fund. For more information, or to purchase tickets, visit www.dvlf.org. It's the Last Chance for LOVE at Dilworth Park, noon – 2 p.m. Bid farewell to the LOVE sculpture as it leaves Dilworth Park. Join MORE FM for love songs, free red roses for the first 200 guests, giveaways, and to take one last selfie with the sculpture. Don't forget to post your photo on Instagram #LOVEatDilworth to enter for a chance to win the gift basket for an excellent date night. SEPTA is asking "Did you find love on Septa?" Stop by the Septa table and share your love story. Greater Philadelphia Gardens, which partnered with the CCD to create America's Garden Capital Maze, will present free horticultural programs for both families and adults through February 25. Programs will be held in the Rothman Institute Cabin and are made possible by generous funding from the William Penn Foundation. Learn how to craft a gorgeous display at Valentine's Day Floral Arranging, led by Shawn Alexandra Graham, Floral Stylist/Event Designer, noon – 1 p.m., in the Rothman Institute Cabin. Participants can enter to win a raffle for the flower arrangement made during the seminar. Enjoy College Night, where college students pay just $2 for admission (skate rental not included) for an evening of fun with your sweetie or group of friends at the Rothman Ice Rink. Every Tuesday night, from 5 p.m. to 9 p.m. through February 21, stop by and enjoy what Rothman Ice Rink and Cabin have to offer. The LOVE sculpture will be removed from the park to be restored before it moves back to its original home at LOVE Park. If you enjoyed summer's Center City District Sips, you'll love Cocktails and Cold Ones in the Rothman Institute Cabin. Every Wednesday night, from 5 p.m. to 7 p.m. through February 22, stop by for Cocktails and Cold Ones with $5 Jim Beam Apple and Effen Blood Orange Vodka cocktails, $4 wine, and $3 Sam Adams drafts, along with specially priced food items from the Dilworth Park Air Grille. Check out the presentation Flowers to Wear, led by Shawn Alexandra Graham, Floral Stylist/Event Designer, 10 a.m. to 11 a.m., in the Rothman Institute Cabin. Participants can enter to win a raffle for the flower arrangement made during the seminar. Skate to the sounds of music recorded by The Philadelphia Orchestra, noon – 2 p.m., as part of Philadelphia Orchestra presents Symphony Sundays at the Rothman Rink. After skating, cozy up around firepits in the backyard at Rothman Cabin, where wine, beer, cocktails and hot cocoa are available for purchase. The Rothman Institute Ice Rink will be open for special holiday hours on President's Day, 11 a.m. – 9 p.m. Bring the family to enjoy the last bit of winter fun at the rink. Think spring and come in for a presentation on Seed Starting, noon to 1 p.m., led by Sally McCabe, Associate Director of Community Education, PHS at the Rothman Institute Cabin. Step onto the ice after class, for the last College Night, from 5 p.m. to 9 p.m. where college students pay just $2 for admission (skate rental not included) for an evening of fun with friends at the Rothman Ice Rink. If you enjoyed summer's Center City District Sips, you'll love Cocktails and Cold Ones in the Rothman Institute Cabin. Stop in for the last Cocktails and Cold Ones, from 5 p.m. to 7 p.m. with $5 Jim Beam Apple and Effen Blood Orange Vodka cocktails, $4 wine, and $3 Sam Adams drafts, along with specially priced food items from the Dilworth Park Air Grille. Come in for the last gardening presentation of the season with Seed Starting, noon to 1 p.m. at the Rothman Institute Cabin, led by Mai Schwartz, PHS, at the Rothman Institute Cabin. Hurry in to enjoy skating and sipping hot cocoa before the season ends. The Rothman Institute Ice Rink and Rothman Institute Cabin will close for the season February 26, 2017. Take one last stroll through America's Garden Capital Maze at Dilworth Park. It will close for the season February 26, 2017.